Cyclists and Twitter is often a fantastic combination, allowing the fans a behind the scenes look at what goes on in the professional peloton. Here’s some of the tweets that caught our eye this week, including ones from Dan from Nam, Mark McNally and Cadel Evans. 1. I’m sure Fabian Cancellara will be happy that Trek Factory Racing pulled out this gem of a picture from yesteryear. A mix between a young Stephen Fry and Michael Schumacher (if you squint). 2. Now, this technically isn’t a tweet, but it happened on Twitter, so I’m allowing myself to bend my own rules. 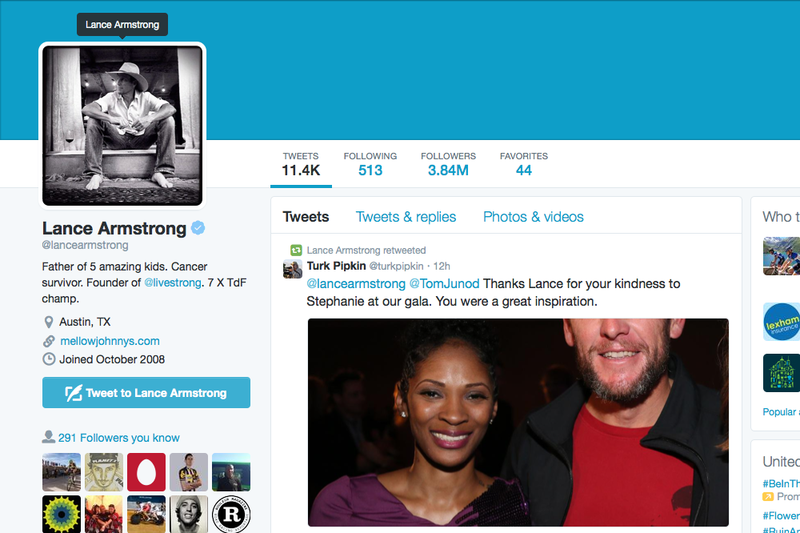 Everybody’s favourite badass Lance Armstrong has ditched his inspirational quote and reinstated his seven Tour de France titles to his Twitter biography. Fighting talk. 3. Everybody’s favourite Namibian cyclist, Dan Craven, won his national title last weekend, but his smartphone doesn’t like him talking about his new kit. I absolutely love how my phone's autocorrect thinks I'm talking about an American state every time I write about my (BEAUTIFUL) New Jersey. 4. 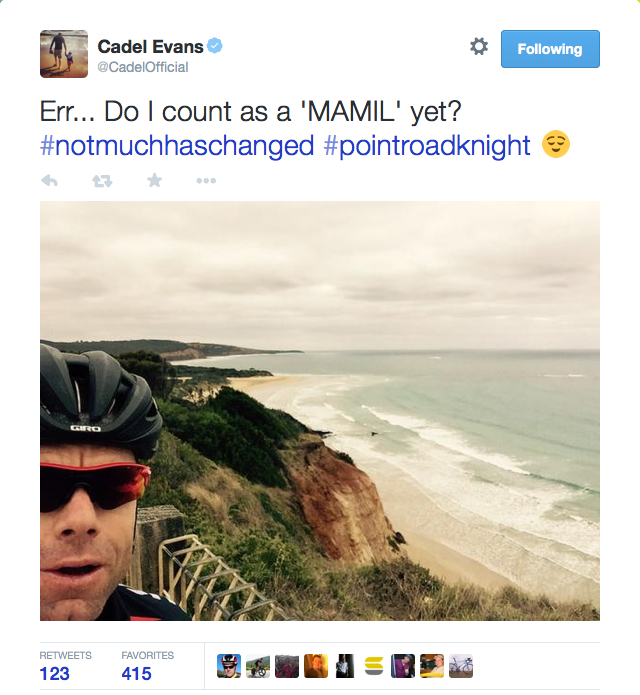 Sorry Cadel, you’ve been a MAMIL for years. 5. Last week we had a couple of inches of snow in the UK, rendering cyclists unable to go outside. Spare a thought for Ted King in the USA, who would probably dream of seeing only a couple of inches of snow. 7. Karsten Kroon advises of “Parental advisory; explicit content” on his Twitter biography, and I was certainly appalled at his assertion that he never worked during his pro career. That was the first working day of my life, commentating on the Tour of Dubai for Eurosport! It was fun! 8. 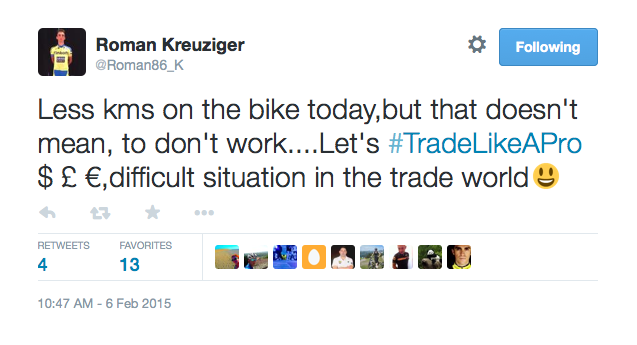 Ryder Hesjedal clearly forgot that he was a World Champion mountain biker in his youth. Now he seems stumped (no pun intended) by a fallen tree. 9. Mark McNally may be wearing some pretty shabby kit this season, if this tweet is anything to go by. 10. Dan from Nam gets his second shout out of the week for his poor grasp of the French language. My GCSE (and A level) French has eluded me, however, so I can’t let Dan know what he needs to say. Answers on a postcard please.